The discipline of International Relations (IR) has for too long been marred by the privileged position of the sovereign territorial state as the unquestioned starting point for any analysis of international affairs. The state and its territorial extension in space as an unhistoricised starting point for IR thinking is the target of Larkins’ inspiring book. He starts off with a critical diagnosis of IR theory. He is critical of the way that territorial sovereignty is taken as a given starting point for thinking politically about the international. While this is a point that has been made before by critical scholars within the discipline, Larkins underlines his critique by drawing a parallel to Immanuel Kant’snotion of the a priori. For Kant time and space constitute pure forms of intuition (Anschauung) that conditions the possibility of talking meaningfully about the world. For Larkins ‘territory serves as an a priori condition underpinning state theory in International Relations’ (p. 19). Larkins critically labels this as the territorial a priori. He suggests that the assumed givenness of the state-territory nexus prevents IR scholars from understanding the proper historical origin of modern politics; and it prevents us from embracing the world in its full complexity and articulate novel and more adequate accounts of world politics. Based on an investigation into the spatial transformation taking place in Renaissance Europe he emphasises the historical contingency of the contemporary international order: ‘the idea of the territorial state is neither universal nor immutable but contingent with a complex history whose origins lie in the Renaissance transformation of man's understanding of his being in space’ (p. 2). As such, Larkins follows the agenda set by critical IR scholars – especially Rob Walker appears as an inspirational figure for Larkins – who have endeavoured to reveal the unspoken assumptions of a discipline trapped within a conceptual straightjacket positing sovereignty, international anarchy, and security politics as necessities for political life. In response, Larkins pursues a dual mission: to restate the Renaissance as a formative period of modern IR; and to show how the transition from hierarchy to anarchy was structured around a new spatiality that came to structure an emerging political reality during this period. It is only natural that this is based on a reading of late medieval and renaissance cosmology. Yet, before we get that far, the first two chapters present the criticism and diagnosis described above. Chapter three presents his notion of territory as being discursive and hence a child of culture and history. While this perspective has merits it also tends to ignore the question of what kind of space territory is. I will return to this issue subsequently. Analytically, the book opens from chapter four which presents a very interesting reading of Dante, Dionyseus and other sources on the medieval ordering of space. The claim here is that hierarchy was the all-encompassing organising principle for political life in the Middle Ages: ‘this vertically ordered Dionysian hierarchy served as the epistemic condition of possibility for the erection of a hierarchical spatial architectonics that would support medieval theocracy for a millennium’ (p. 57-8). Chapter five presents an analysis of the political discourses of Middle Ages centred on discussions of the Papacy, Empire, and Monarchy. Larkins shows how the emerging theory of kingship in the thirteenth century broke with the hierarchical order of medieval cosmological politics. In sequence, chapter six exposes the Renaissance critique of hierarchy as an ordering principle for politics. The critique is expressed by the writings of Marsilio Ficino and Pico della Mirandola representing a new notion of the human soul: ‘their promotion of the doctrine of the dignity of man is important in so far as it anticipates the principle of sovereign identity’ (p. 110), which again leans itself to a less hierarchical ordering of political cosmos. As shown in chapter seven, the departure from hierarchy was captured by Machiavelli with in his political writings on the legal concept of dominion which alludes to a sense of sovereignty; his distinction between internal and external violence which supports the spatial figure of inside/outside; and finally his emphasis on italianita which grounds national identity in the territory of the state. In chapter eight, Larkins demonstrates how art began to visualise land and authority together. Driven by the novel ambition to represent forms of nature geometrically accurate and a new symbolism of power political authority was increasingly represented as being linked to a particular place. These observations are in sync with previous statements on the emergence of territoriality in IR. John Ruggie, for example, has linked the emergence of single point perspective in visual arts with the rise of sovereign territoriality. Chapter nine turns to the territorialisation in international society. Early European colonisation driven by Iberian powers under the auspices of papal authority represented, in Larkins view, a territorialisation of international politics. It signalled an early parcelisation of space on a global scale. With that, Larkins concludes his ¬historical analysis demonstrating the Renaissance emergence of the territorial imaginary that has been turned into the territorial a priori in IR. While the specific arguments related to the historical account are persuasive and insightful, the general argument of the book might leave the reader familiar with the IR debates on territoriality with a desire to learn more. There is a sense in which the historical material is portrayed so it supports the argument of scholars such as Walker and Richard Ashley. Larkins is quite blunt in his criticism of IR scholars for not engaging properly with history and the classics in political theory. Yet, he rarely strays from or questions the established arguments within poststructuralist writings in IR. And this is a shame for two reasons. First, Larkins own account and reading of the period is more detailed and thorough than the mentioned authors. As such he could possibly have done more to push this research agenda towards new insights rather than – as he does at times – confirm empirically what has been established in more abstract writing within the discipline. Second, I am not always persuaded that the overall conceptual framework match the historical ambitions of Larkins. The key issues here are the notion of territorial a priori and his conceptualisation of territory as discourse. Both ignore the broader spatial transitions that took place during the period and which are not easily captured within a framework of territory only. In chapter nine, for example, when he suggests that the papal division of the world into a Spanish and a Portuguese sphere in 1493 represented a territorialisation of international society, I disagree. This was rather about a new relationship between space and sovereignty that was not necessarily territorial. Early European expansion was more about linking sites in networks of trade and exploitation than about a particular territorial logic.In conclusion, Larkins’ book is highly recommended as a historicalspecific account of the emergence of non-hierarchical and spatially particular politics in the Renaissance. There is much need for this type of study in IR. However, this recommendation does not come without a slight regret that the book could have done more to question the relationship between space, territory and politics rather than adopting the maybe not so helpful notion of a territorial a priori. 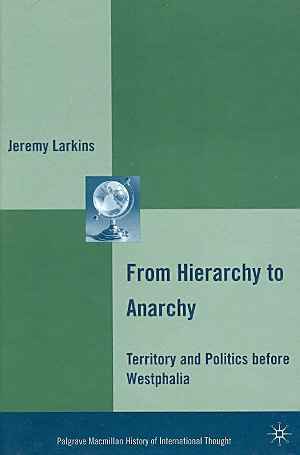 Jeppe Strandsbjerg: Rezension zu: Larkins, Jeremy: From Hierarchy to Anarchy. Territory and Politics Before Westphalia. New York 2010 , in: Connections. A Journal for Historians and Area Specialists, 15.02.2013, <www.connections.clio-online.net/publicationreview/id/rezbuecher-14888>. Copyright (c) 2013 by Clio-online, 'Connections', and the author, all rights reserved. This work may be copied and redistributed for non-commercial, educational purposes, if permission is granted by the author and usage right holders. For permission pl ease contact connections@uni-leipzig.de or hsk.redaktion@geschichte.hu-berlin.de.